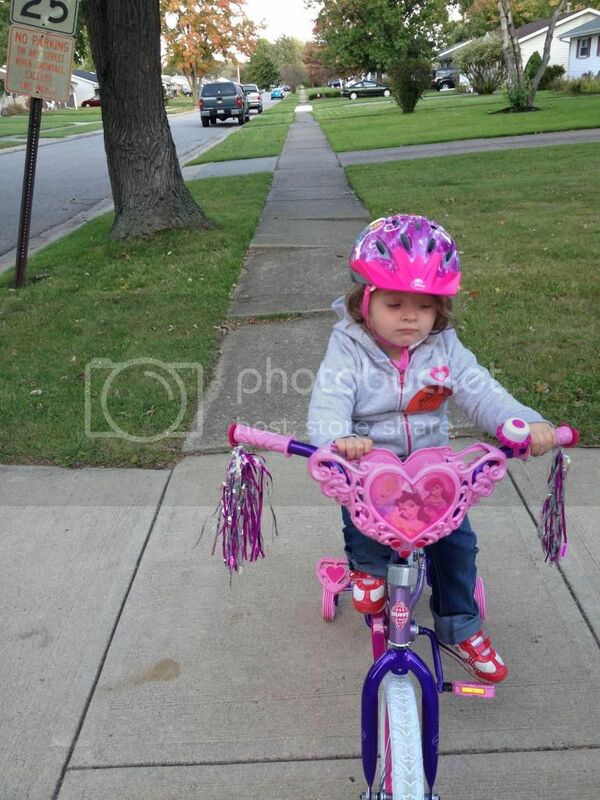 Aubriella turned 3 this year and I decided to get her a bike for her birthday. It wasn't as easy as I expected. Since Ella is tall for her age I couldn't just get her a bike that was for a 3 year old beginner. If I did that it would probably only fit her for a few months if that. 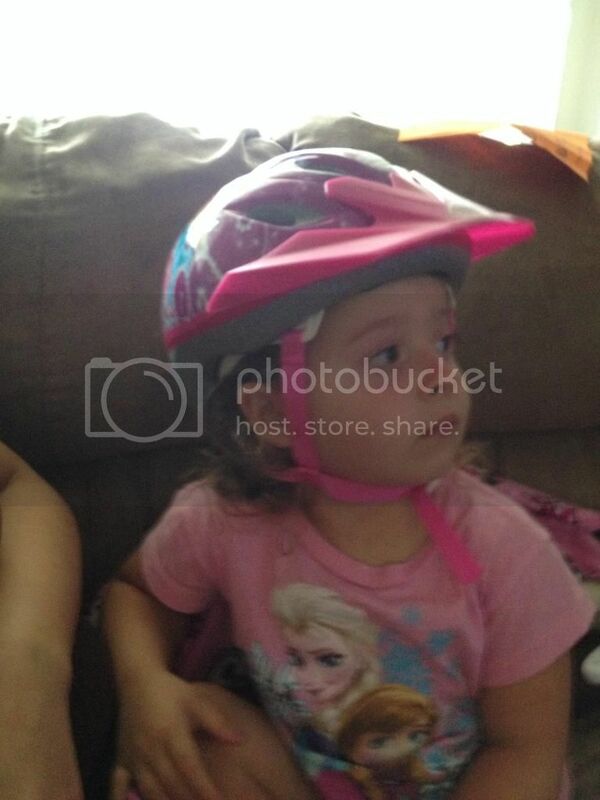 Also when she tried on helmets the typical 3 year old helmet was to small. Had to find a bigger bike that would work for her. I had found a really cute Minnie Mouse bike at Toys R Us but it was to small and weirdly had a front hand break. I would be afraid that Ella would use the hand break and go flying over the handle bars. The matching helmet only came in a the 3 year old size. I eventually decided on a Disney Princess bike with a heart basket. Right now it is a little big, but by next spring it should be perfect for her. I also got her a princess helmet. 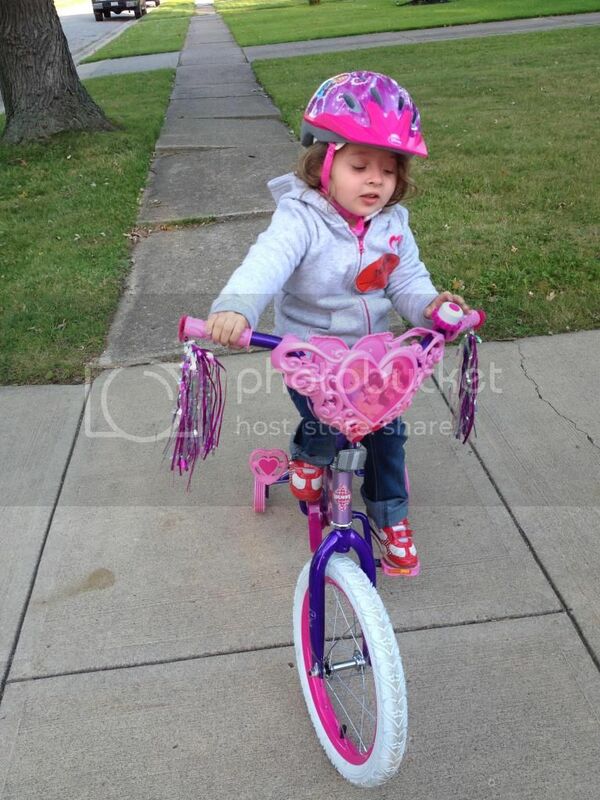 The other day it was somewhat nice outside so I let Ella go outside for a little bit and ride her bike. She needs to work on her pedaling and steering and watching where she is going but it will all come in time. She had a blast and didn't want to come in. Every day she asks to go out and ride her bike but the weather has been raining and cold. Any suggestions to teach a toddler to ride a bike? How old were your kids when they got their first bike?